Campions are built in Canada and, indirectly, that’s why their hulls have a 10-year warranty: the likelihood of meeting floating logs is so high in Canadian waters that large quantities of Kevlar armour are included in the lay-up. 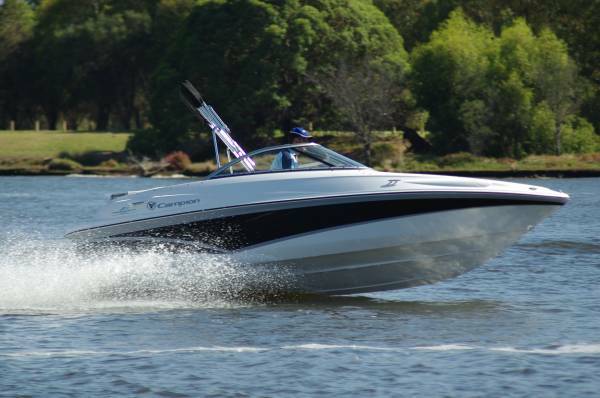 Today’s Campion, the 545 Allante, is almost the definitive North American boat – a bow rider. Bow riders make first class day boats with their abundant seating, the bow compartment being ideal for keeping small children under the driver’s eye. 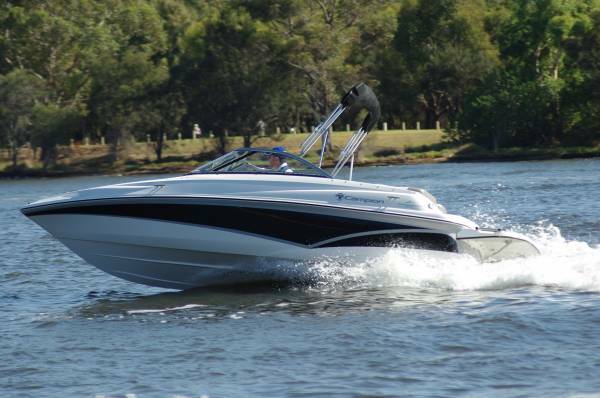 And this is also the style of almost all current ski and wake board towboats. 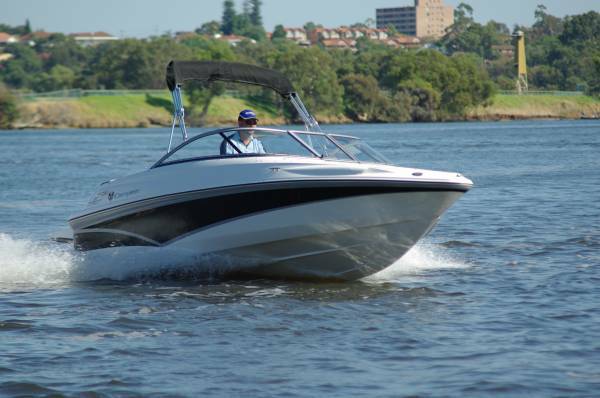 The review boat was powered for multiple tows with a 260hp 5-litre MPI Mercruiser, although skiing would still be on the menu with the modest option of the 130hp carburetted four-cylinder Mercruiser – at a multi-thousand dollar saving. 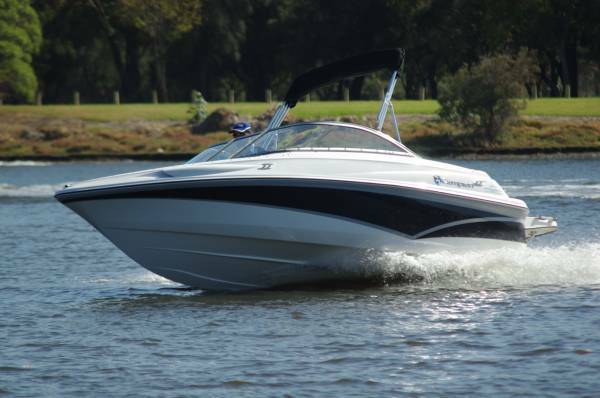 But not all 260hp buyers are skiers: the agents say that this is a popular boat with baby boomers. Presumably the leadfoots, since the 260hp is good for 43 knots reached, even with eight people on board, at a rate to set eyeballs back in their sockets. Skiers get the usual under-deck locker to stow their skis and boards, plus lockers and pockets for everything else. Wherever you feel the need to park a glass or plate you will find a purpose-designed spot to do just that. 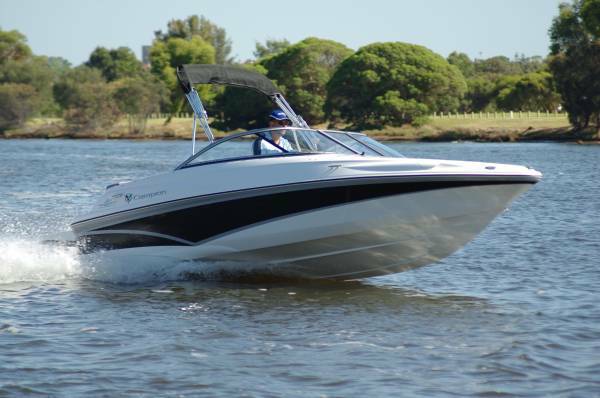 The 545 has a sun bed over its engine compartment, as many up-market bow riders do, but offers a better route over it from the boarding platform than most. The platform is a beauty too, being extended in length and area, and travel from it with wet or dirty feet does not hurt the upholstery: the centre section of the rear lounge lifts out. Lifting also reveals the esky and one more locker. There is no need for feet to wet the carpet either: it is held by press-studs and is easily rolled up for swimming and skiing days. The seats are good enough for all-day comfort. Both of those at the dash have bolsters for raised driving positions, and those in the forward cockpit have turned up after ends to allow a favoured couple to lie back whilst looking ahead. Handy drink holders and powerful Clarion stereo speakers add to the Roman-style hedonism. The driver’s seat faces an adjustable wheel and a sports car-style dash featuring no less than seven analogue gauges. For something as important as engine monitoring, a glance to check the slant of a needle does the job far more quickly than reading a number in a panel. There are even more switches than gauges, including one for an extremely useful pair of lights – headlights. Docking lights, the builder calls them, but they have more uses than that. If you are returning to an up-river ramp after dark on a moonless night they will spot the unlit channel markers for you. Sun protection includes a Bimini with storage sock and a bow sunbrella cover for the benefit of people, and full storage covers for the benefit of the boat. However high the quality of the upholstery it will not like non-stop sunlight, and the same applies to the carpet and gelcoat. There is a lot of hardware around the 545, and everything that should be hard is: stainless steel rather than plastic. 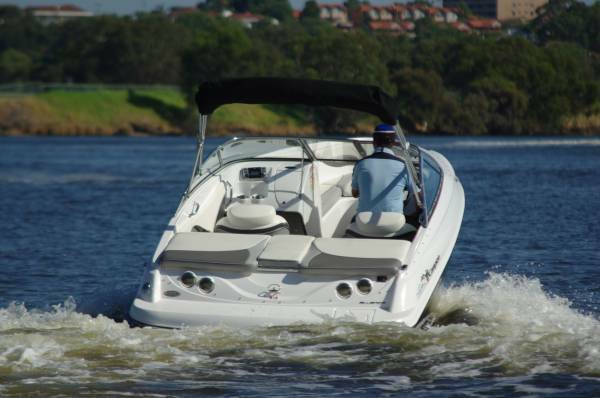 Grab rails, Bimini fittings – even the drink holders. Another welcome inclusion is the 12V socket: someone always needs to charge something or power a portable gadget. Unlike many imports, the Campion does not have a hull that is happy only in sheltered waters. Viewed out of the water it reveals the lines of an offshore hull, and under way the physical impressions back up the visual. The ride is very good and readily adjustable by leg or tab trim – important when a lot of weight can be carried forward – and is dry. Which is just as well for a bow rider. Trailers have improved at least as much as boats in recent years, and the dual axle, multi roller model in the Campion package is a fine example. The 545 rolled off unassisted at launch time, and driving on at recovery time was almost a self-aligning job. That’s the way to end a day’s boating.